It has been almost a year since the attacks on the World Trade Center and the Pentagon. For many Americans, those images called more into question than just their own physical safety. For many people, the most difficult questions were not about politics, military strategy, or homeland security. They were questions about God, about evil, and about the potential for darkness within religion itself. And for many, those questions haven't gone away. As the country prepares to commemorate the victims and heroes of Sept. 11, FRONTLINE returns to Ground Zero, both literally and metaphorically, and explores these fundamental spiritual questions. What was it we saw on Sept. 11? Was it the true face of evil? Was it the face of religion? And where, if one is a believer, was God? Indeed, if one is not a believer, did Sept. 11 make the idea of God that much more of an impossibility? Or was there something in the human response to the tragedy that suggested transcendence? Helen Whitney -- the producer, director, and co-writer of "Faith and Doubt at Ground Zero" -- offers her personal reflections on the making of the documentary. In "Faith and Doubt at Ground Zero," FRONTLINE producer Helen Whitney sets out to discover how the religious beliefs -- and unbelief -- of Americans have been challenged since the events of Sept. 11. Through interviews with priests, rabbis, and Islamic scholars, victims' families and World Trade Center survivors, writers and thinkers, atheists and agnostics, this two-hour documentary explores whether, and in what ways, Americans' spiritual lives may have changed on that day. The documentary begins with memories of Sept. 11 as both survivors and relatives of World Trade Center victims recount the shock of the initial attacks and the horror of realizing that their friends and loved ones had perished. Almost immediately, it seems, some people began questioning the idea of God. "I saw the pictures of the people at the windows knowing what was happening -- that there was no ladder, there is no ladder long enough to reach me. There is no helicopter on the roof that is going to come," recalls Dr. Michael Brescia, a physician. "I wonder how many of them thought if there was a God. And if there was a God, why me? Why this? And where am I going to go?" Some people, even those who lost loved ones in the attacks, say the tragedy only affirms their belief in a higher power. "At this stage, I have not questioned Him," says Bernie Heeran, a retired firefighter whose son Charlie was killed on Sept. 11. "He had nothing to do with this. There were a lot more people who could have been killed. He was fighting evil that day like He does every day." Others are neither so certain nor forgiving. "I can't bring myself to speak to Him anymore because I feel so abandoned," says Marian Fontana, whose husband, David, was one of the 343 firefighters killed that day. "I guess deep down inside I know that He stills exists, and that I have to forgive and move on. But I'm not ready to do that yet." Still others, including religious leaders, report that while they continue to believe in God, their image of Him has been altered in the wake of the tragedy. "After Sept. 11," says the Rev. Joseph Griesedieck, an Episcopal priest who volunteered at Ground Zero, "the face of God was a blank slate for me. God couldn't be counted on in the way that I thought God could be counted on. ... God seemed absent. ... I was left with nothing but that thing we call faith. But faith in what? I wasn't so sure. ... 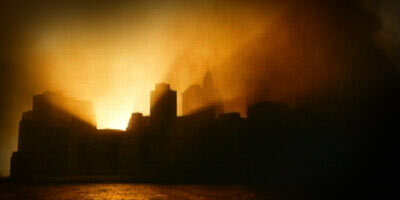 The face of God after Sept. 11 is much more of a mystery than it ever was. ... A face that often eludes us, and frustrates me." The attacks also seem to have reopened the investigation of evil -- a word that had seemingly fallen out of fashion. What is it we talk about when we talk about evil? And have we learned something new about evil since Sept. 11? Andrew Delbanco, a professor of humanities at Columbia University, thinks so. "I have felt for some time that American culture has lost touch with the reality of evil," Delbanco, an agnostic, tells FRONTLINE. "We really did experience evil on Sept. 11, and we need to think about it and understand it in order to be able to cope with it, both in others and ourselves." The novelist Ian McEwan takes a different view. "I don't believe in evil at all," he says. "I think there are only people behaving -- and sometimes behaving monstrously. And sometimes the monstrous behavior is so beyond our abilities to explain it, we have to reach for this numinous notion of evil." Particularly troubling to some individuals is the role of religion in the attacks. In "Faith and Doubt at Ground Zero," FRONTLINE speaks with several religious leaders and scholars who now find themselves confronting the potential for violence and inhumanity within their own religious traditions. "From the first moment I looked into that horror on Sept. 11, into that fireball, into that explosion of horror, I knew it," says Monsignor Lorenzo Albacete. "I recognized an old companion. I recognized religion." Rabbi Brad Hirschfield agrees. "Religion drove those planes into those buildings," he says. "It's amazing how good religion is at mobilizing people to do awful, murderous things. There is a dark side to it, and anyone who loves religious experience, including me, better begin to [admit] that there is a serious shadow side to this thing." Khaled Abou El-Fadl, a Muslim and a professor of Islamic law at UCLA, finds himself at odds with extremist elements within his own faith. "I am fighting for the soul and identity of Islam itself," he tells FRONTLINE. "There is no question that the extremists and puritans want to be the only representatives of Islam. ... The most dangerous type of thinking would allow a person to think they speak authoritatively and decisively for God. And that type of thinking is more widespread in contemporary Islam than Osama bin Laden." In its final act, the documentary explores the search for hope amid the rubble of Ground Zero, and concludes with a brief epilogue in which people recall one of the more indelible images of Sept. 11: the sight of a man and a woman jumping from the burning towers, hand in hand. It's an image that few have forgotten, and one that provokes starkly different responses. "To me it was just the bleakest possible image of the whole thing," author Ian McEwan says. "What I saw was utter desperation. ... I found no hope in that at all. If there is a God, he's a very indifferent God." But the writer Brian Doyle sees it differently: "They reached for each other, and their hands met, and they jumped. ... I keep coming back to his hand in her hand. ... It's the most powerful prayer I can imagine -- the most eloquent, the most graceful. ... It's what makes me believe that we're not fools to believe in God." The film's last words belong to Monsignor Albacete: "This gesture, this holding of hands in the midst of that horror, it embodies what Sept. 11 was all about. The image confronts us with the need to make a judgment, a choice. Does it show the ultimate hopelessness of human attempts to survive the power of hatred and death? Or is it an affirmation of a greatness within our humanity itself that somehow shines in the midst of that darkness and contains the hint of a possibility, a power greater than death itself? Which of the two? It's a choice. It's the choice of Sept. 11."